Duck is the common name for a number of species in the Anatidae family of birds. 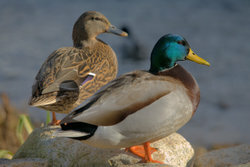 The ducks are divided between several subfamilies listed in full in the Anatidae article. Ducks are mostly aquatic birds, mostly smaller than their relatives the swans and geese, and may be found in both fresh water and sea water. Most ducks have a wide flat beak adapted for dredging. They exploit a variety of food sources such as grasses, grains and aquatic plants, fish, and insects. Some (the diving ducks) forage deep underwater; the others (the dabbling ducks) feed from the surface of water or on land. To be able to submerge easier, the diving ducks are heavier for size than dabbling ducks, and therefore have more difficulty taking off to fly. A few specialized species (the goosander and the mergansers) are adapted to catch large fish. The males (drakes) of northern species often have showy plumage, but this is moulted in summer to give a more female-like appearance, the “eclipse” plumage. Many species of ducks are temporarily flightless while moulting; they seek out protected habitat with good food supplies during this period. This moult typically precedes migration. Some duck species, mainly those breeding in the temperate and arctic Northern Hemisphere, are migratory, but others are not. Some, particularly in Australia where rainfall is patchy and erratic, are nomadic, seeking out the temporary lakes and pools that form after localised heavy rain.